Infolinks is top most In-text based online Advertising network. Infolinks is one of the largest Advertising platform for both parties Advertiser and Publisher. Whenever we talk about online advertising network including Adsense, Yahoo Bing Network then the most trusted name which comes out is only Infolinks. 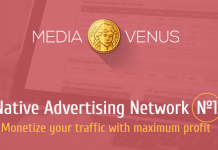 Whether Adsense, Media.net all these network are of big Famous Incs but Infolinks is only which makes their own place between all of them which is absolutely a great achievement. Factors which act like a success key for Infolinks is there new way of Advertising on websites. It also work like best alternative with other ad networks because its totally advertise with different concept. 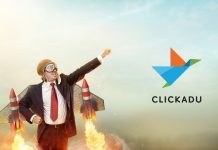 We use advertisement which are of Banner or Pop up but using more banner need space but infolinks developed keyword based advertising technique which is easiest and best way. So today i will explain some fact and ideas about infolinks and i will try my best to explain working of infolinks and how it will be helpful for webmasters for monetizing. Make Money As Infolinks Publisher ? Infolinks is Self-served marketplace so many big brand and companies are investing in infolinks ads with good budget and offer good rates. If you are a webmaster and having blogs or website which generate good amount of traffic then infolinks is also a best choice. Many publishers many think that they are are using other ads platform for monetizing and already having many banners within their pages and can infolinks complete with them? or infolinks hurts your current banner rates of adsense?. 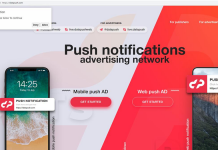 No, infolinks totally adsense friendly platform and infolinks work like an best alternative with banner ads for earning extra revenue because infolinks serves ads in different way. Reasons Why to Choose Infolinks ? Infolinks Approval process much easier than other publisher platforms. If your blog is good and receives few impressions. Then you will get approval in publisher platform. Only few sites which does not matches with program policies got rejected. 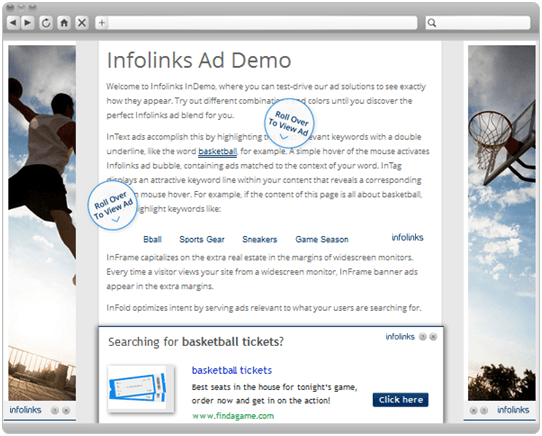 Infolinks work as best alternative for Banner Ads platform like Google Adsense or Yahoo Ads. Just because they offer Keyword based ads in various format of in-text, in-tag, in-frame or in-fold. All these format cover much lesser space as compare to banner based advertisement. Infolinks serves GEO targeted based ads. Infolinks serves ad in eCPM technique which is formed with combination of CPC and CPM. They offer good rates for eCPM if your blog is based on good Niche and having good traffic. To Join Publisher platform visit Infolinks here. Here is example of all ad format display on web page. This includes all format but you can use according to your requirement. Many users are disappointed with other platforms like Adsense because of the hard policies. So they just leave our their platform with using other best alternative platforms. I always recommend to my readers always use infolinks if you are not using any big publisher platform like adsense, BSA then Infolinks is best choice for you and if you are already using big networks then also use infolinks with them for extra revenue. Infolinks provide In-text based keyword advertisement means ads will be shown according to relevant content and also having much higher CTR as compare to Banner ads. Infolinks best place to overcome Banner Blindness. Infolinks is Four largest Marketplace in the World with 100k+ websites and blogs from 128+ countries. Higher conversion rate just because of using various technique of advertising like in-text, in-tag, in-frame. To Join Advertisement platform visit Infolinks here. So what you say about infolinks ? and must share your experience in below comments. Next articleHow To Make Money From Google Adsense ?